The Wehrmacht was used as a tool of state policy in the Second World War, for both military and political aims. There is considerable controversy over the allegations that the Wehrmacht was found to be significantly rather than incidentally involved in the Holocaust, especially because the elements of the SS involved in the Holocaust were not the Waffen-SS and not under the control of the OKW or field commanders. 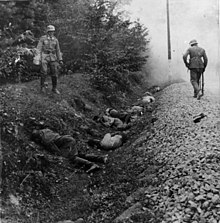 The Wehrmacht ordered and participated in massacres of civilians for reprisals, executions of prisoners of war, summary executions of Soviet political officers and executions of military and civilian hostages as punishment for partisan activities in occupied territories.However, the oft-repeeated claim of breaking the Geneva convention by its treatment of Russian prisoners of war is not correct. Common Clause 2 of the Geneva Convention states that the treatment requirements apply where both parties are signatories of the Conventions. The Germans were signatories, The Russians refused to sign. ↑ When West Germany remilitarized in 1955, its newly-created armed forces became known as the Bundeswehr ("Federal Defence Force"). East Germany's armed forces, formally established in 1956, were known as the National People's Army (Nationale Volksarmee). When East Germany (the German Democratic Republic) was incorporated into "West Germany" (the Federal Republic of Germany) in 1990, much of the Volksarmee property and some of the staff were also incorporated into the Bundeswehr. 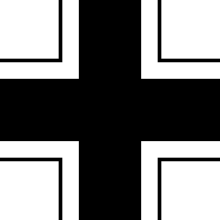 Wikimedia Commons has media related to Wehrmacht. This page was last changed on 7 July 2018, at 10:43.